Amid media merger frenzy, Lionsgate, Viacom, and Discovery could make attractive targets. As Netflix's (NASDAQ:NFLX) blowout earnings showed, scale matters more than ever in the media industry. With distribution going increasingly over the top via the internet, companies will be able to scale their offerings globally. That has allowed huge tech companies from Silicon Valley to enter the content game. Amid these changes, increasingly huge distribution platforms need must-watch content. At the same time, smaller content players may find licensing negotiations more difficult when dealing with giant distributors. Therefore, we are seeing increasing consolidation in the industry. AT&T (NYSE:T) kicked off the party in its attempt to acquire Time Warner (NYSE:TWX.DL) in 2016, then Disney (NYSE:DIS) followed suit by announcing it was acquiring Twenty-First Century Fox (NASDAQ:FOX) (NASDAQ:FOXA) in December. Which might be the next media company to get scooped up? Here are three intriguing names that could find a suitor in the year ahead. When Lionsgate (NYSE:LGF-A) (NYSE:LGF-B) was founded in 1997, it was the first new studio in Hollywood since 1923. The company grew from a small base by funding smaller, low-risk horror films and comedies, and consummating a series of savvy mergers with independent studios Artisan Entertainment and Summit Entertainment, the latter bringing with it the Twilight franchise. Lionsgate then made a bigger splash with its first bona fide blockbuster, The Hunger Games, back in 2012. More recently, Lionsgate acquired premium cable channel Starz in a cash-and-stock deal. That acquisition, likely spurred on by media mogul John Malone (who owned large stakes in both companies), has been challenged in court by activist investor Paul Singer, who claims Lionsgate was able to acquire Starz on the cheap because of a conflict of interest. If Singer prevails, Lionsgate -- and, therefore, anyone who might acquire Lionsgate -- may be on the hook for as much as $500 million. That may deter a potential suitor, but since the rumored Lionsgate acquirers Amazon (NASDAQ:AMZN), Verizon (NYSE:VZ), and CBS (NYSE:CBS) have rather deep pockets, they could go ahead anyway. If one of these companies does purchase Lionsgate, it will then own a deep film and TV library through Starz. Liongate CEO Jon Feltheimer has said the company's biggest priority is producing (and, therefore, owning) "must have" content for Starz. While CBS is one of the rumored acquirers of Lionsgate, it has also been the subject of rumors regarding Viacom (NASDAQ:VIA) (NASDAQ:VIAB). This is natural, as the two companies were once part the same company before Viacom was spun off in 2005. Both companies are still controlled by the Redstone family, and patriarch Sumner Redstone's daughter Shari, who is vice chairwoman of both companies, is reportedly trying to get CBS and Viacom back together. Viacom has suffered from the rise of cord-cutting, as its main cable channels MTV, Nickelodeon, and Comedy Central are experiencing declining ratings. In addition, Viacom's film studio, Paramount, has posted losses in each of the last three years. Viacom has a new CEO in Bob Bakish, who has outlined a comprehensive turnaround plan, but he has been on the job only about a year, and the plan has yet to bear fruit. CBS management has apparently been wary of a remerger, believing the overhang may cloud talks with more desirable targets, like the aforementioned Lionsgate, or even Time Warner, should AT&T lose its bid. 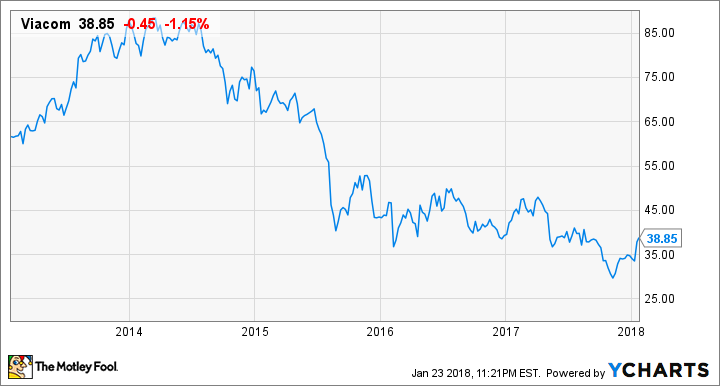 Another company in John Malone's sprawling media empire is Discovery Communications (NASDAQ:DISCA) (NASDAQ:DISCB) (NASDAQ:DISCK). Discovery is currently in the midst of its own merger with Scripps Networks Interactive (NASDAQ:SNI), but that doesn't mean it couldn't be an attractive asset to a larger conglomerate, especially as the stock has declined roughly 8% over the past 12 months. Discovery and Scripps combine for about 20% of the primetime ad-supported cable audience. In addition, because they create nonfiction television, production costs are only about 10% of what they are for scripted series. In addition, Malone recently increased his stake in the company in December, signaling confidence in company's management behind Discovery CEO David Zaslav. If a large company is looking for a low-cost way to get internationally scaled content, Discovery could be an attractive purchase. The media industry is in a mini-upheaval, but since getting big is the name of the game these days, these companies, though challenged, could make attractive targets for the right buyer.